Real sounds from real instruments. music of expression instruments sound like the real thing. We've painstakingly recorded real musicians playing these instruments, and then optimized these recordings for smooth and enjoyable playback through our iPhone instruments. 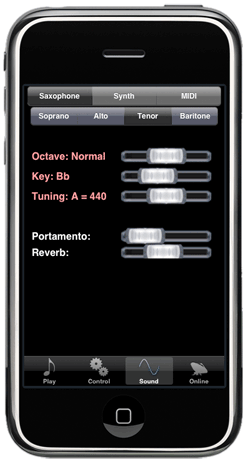 You can even smoothly slide from note to note, and sustain your note as long as you would like. The sound is completely smooth and seamless. Multiple sound sets for all! Playing Saxophone? Choose between the members of the saxophone family, from soprano to baritone. TRUMPETers can play naturally or put in the harmon mute for a bluesy bebop vibe. Clarinetists can switch to a slightly darker A clarinet for Mozart, or jump to a bass clarinet to get some earthy funk. And of course, you can explore more sounds with our unique Visual Synth! That's right -- each music of expression instrument essentially includes multiple instruments. How's that for bang for your buck?